Sin-Yen obtained his B.S. degree in Chemical Engineering at the National Taiwan University (NTU). 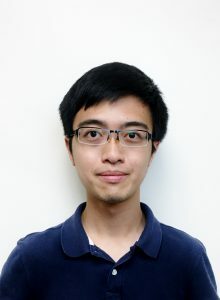 His first research experiences were at NTU in nanoscience and nanomaterials related field – including synthesized and assembled mesoporous silica and titania nanoparticles. Sin-Yen has also participated in research experiences for the study on metal-organic-framework (MOF) materials synthesis and characterizations. Currently, Sin-Yen is a graduate assistant within the Chemical Engineering (ChemE) Department at the University of Florida. Sin-Yen is working, under Dr. Peng Jiang’s guidance, with the focus on developing novel approach to manipulated sub-micron-nanostructure of glassy polymers at room temperature, theoretical and analytical study of the diffusivity of small organic molecule in polymers, and designing reconfigurable antireflection coatings for solar cells application. Sin-Yen’s research interests include chromogenic sensors, shape memory polymers, nanomaterials, self-assembly, cold programming, and photonic cyrstals. Abstract: Here we report novel chromogenic sensors that exhibit easily perceived color changes when exposed to different external stimuli, such as pressure, shear stress, ballistic impact, a large variety of vapors and liquids, heat, and acoustic wave. These multifunctional sensors are reusable, inexpensive, light weight, consuming no electrical power, and very small footprint, promising for a spectrum of applications ranging from user-friendly environmental monitoring to specifically sensing chemicals. This new technology is enabled by integrating scientific principles drawn from two disparate fields that do not typically intersect – the fast-growing photonic crystal and shape memory polymer (SMP) technologies. The active components of the SMPs are thin macroporous photonic crystal layers (only a few mm thick) which are fabricated by using self-assembled, 3-D highly ordered colloidal crystals as structural templates. This microscopic thin-film configuration renders orders of magnitude faster response speed than bulky SMP samples in traditional applications. This innovative technology could made polymer sensors that are durable, highly sensitive (10 ppm to 30% ethanol in gasoline) at low cost. Users could detect the concentration just by looking at the color change of the sensor. Although we have demonstrated that this technology could be used to detect ethanol, our preliminary work indicated that the concept can be adapted to detect a large variety of other analytes (e.g., peroxides and formaldehyde), promising for a wide spectrum of applications ranging from environmental monitoring and workplace hazard identification to threat detection and process/product control in chemical, petroleum, and pharmaceutical industries.